We came down out of Norfolk, and at once the Lothingland peninsula softened. We were escaping from the awful orbit of Great Yarmouth, and the lanes threaded through woods and meadows. Ahead, the round tower of St John the Baptist came into view above the hedgerows. It's a plain, domesticated tower in comparison with its primitive neighbour at Blundeston, but people do not generally come to Lound because of an interest in early medieval architecture, as we shall see. St John the Baptist sits quietly in its trim churchyard on the outskirts of its village. It is pleasant and unassuming. But the interior of this building is one of the glories of 20th century English church architecture. Booth Lynes, the Rector in the early years of the 20th Century, commissioned and paid for what can only be described as a ritualist makeover. The great Sir Ninian Comper designed and installed a sumptuous Anglo-catholic vision of a pre-Reformation liturgical space. In general, the Anglo-catholic movement reached East Anglia rather late. Perhaps this was a result of a vestigal puritan suspicion of 'popery', or a succession of low church Bishops of Norwich, or even typical East Anglian resistance to change. Where the teachings of the Oxford Movement did result in early Anglo-catholic enthusiasm, as at Barsham and particularly Claydon, there was great controversy. It would not be until the 1930s that the tradition would reach Walsingham, today seen as its heartland and touchstone. Comper's work here was carried out between 1912 and 1914, and this makes it a snapshot of the apotheosis of the ritualist Church of England. On the eve of the First World War, the Church was at its height as a national and sacramental institution, a position so powerful that it was able to offer both a mystical legitimation of the War, and a focus and ministry for its grief. But the Church of England would never be the same again. The old certainties had been destabilised by the War, and the social structure of England was changed forever. When Comper returned to Lound in 1920, it was to design the war memorial set outside on the south wall of the nave. But that was all in the future. I approached the porch with some excitement, because it had been several years since I had last visited Lound, and I was looking forward to reaquainting myself with the interior. The outside doors were open, and above the south doorway was a large banner reading WELCOME. The Anglo-catholic tradition that churches should always be accessible for private prayer and devotion in the presence of the sacrement is remembered and re-enacted here daily. On a sunny day, stepping into the nave here can be like stepping into a jewel. The four main features immediately obvious from the doorway are the spectacular organ case, the great font cover, the gilded rood screen, and Suffolk's only modern wall painting of St Christopher directly opposite. St Christopher is a jolly bearded fellow, showing a fair amount of leg. Fish swim in the water about the Saint's feet. A water mill at the bottom has a man with a Suffolk Punch standing outside, and Comper put in a little portrait of himself driving his Rolls Royce along the river bank. When the painting was restored in 1964, a jet plane was added, flying above the Christ child's head. The 15th Century font is one of the few medieval survivals in the church, but even this became part of Comper's grand plan, and the shields held by the angels were repainted in a medieval style. Above it towers a magnificent golden font cover attempting to out-Salle Salle. In any other church of this size the font cover would be overwhelming, but here it acts as a link between Comper's screen and the great organ case over the west door. This is a curious mixture of Baroque and High Gothic. Comper justified this with his usual argument of 'unity by inclusion', which must have always been a useful weapon when dealing with doubtful churchwardens. The inscription is from Psalm 150. The organ it contains is a particularly fine instrument, according to organs expert Basil Rollason. A two manual by Harrison and Gibson, it has eighteen stops, and was completely restored in 1996. The simple benches of the nave, the plain walls and clear glass lead the eyes to the main focus of Lound church. This is Comper's screen. The rood group above is set on what look like Chinese dragons. Comper interpreted the rood as a 'Tree of Glory', and the cross is vine-like. Along the front of the rood loft are angel musicians and heraldic shields. These are a curious collection, representations including Edward III, who had been on the throne when much of the nave was built, the Bishop of Norwich (although he was by no means High Church), and the Lynes family. The G and M above the entrance do not represent Saints, but George V and Queen Mary, who were on the throne at the time. At the far south end of the screen is a Lady Altar, in a similar style to that at Ranworth. It depicts three of the Holy Kinship - St Elizabeth with the young St John the Baptist and St Mary Salome with the young St John the Evangelist flanking the Blessed Virgin and Christ child. The exhortation above is for us to pray for the well-being of Father Lynes - not for his soul, because of course he was still alive at the time. This must have been a very plain and simpe church before the Anglican revival, but in fact Lynes and Comper were not the first to try to beautify it. Lound screen is one of only a few East Anglian screens which is kept locked, but by looking through it you can see some exquisitely beautiful windows by the great Henry Holiday, one of the finest of the late 19th century stained glass artists. They were installed at the behest of Lynes' predecessor. The best of them is the one on the north side depicting the Presentation in the Temple: Mary and Joseph look on at the rapt expression on Simeon's face as he contemplates what his eyes have seen. Anna stands beside him quietly. At the east end is Comper's English altar with its Sarum riddel. It is, perhaps, an anti-climax after the splendours of the screen, but it is lent gravitas by its distance and untouchablity. I am not an Anglican, but it is impossible not to get a sense of what this focus must mean for a believer in Anglo-catholic teaching. It is an appropriate end to the journey from west to east, and there is a harmony to the whole, a sense of Comper's vision made real. In all Suffolk, only Kettlebaston can match it for its power. For the medieval historian, there is very little evidence left, but even that old traditionalist Munro Cautley did little more than be grumpy at what has happened to this church. And Betjeman loved it. I'd come here with my friend John, and he told me a wonderful story. 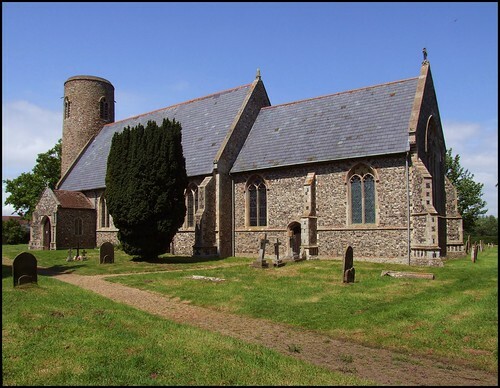 When he was young, he watched a television programme that Betjeman did about East Anglian churches. One of them was Lound, and the way that Betjeman stuck his head through the rood screen to gaze at Comper's chancel made a deep impression on John. The following day, John's careers teacher asked him what he wanted to do when he left school. "I want to do what John Betjeman does", John told him. To his eternal credit, the careers teacher suggested that John write to Betjeman, which he did. Betjeman replied, inviting John for tea at his Chelsea flat, and they became friends. At the time, Betjeman was involved in helping set up the organisation Friends of Friendless Churches, and after Betjeman's death John took his place on the board. Today John works for the Churches Conservation Trust, as well as lecturing on churches and church history, and leading guided tours to medieval churches. And all thanks to a television programme and a wise, patient teacher. I suppose that it should not be surprising that something extraordinary should have happened as a result of a visit to this place. St John the Baptist is often refered to as the Golden Church, because of Comper's gilding, but really there's more to it than that. There was an earnestness to the strength of the faith which caused this transformation, and this is a place which feels hallowed by prayer, as all churches should, but by no means all do. The illusion of permanence which the Anglo-catholic movement sought, the desire to erase the wrongs of the Reformation by creating a sense of continuity back to the early church, is written physically in Comper's furnishings. In those days, the Anglo-catholics were in the ascendant, and they firmly believed that, ultimately, the entire Church of England would be like them. Then, by an inevitable process, the 'Roman' Catholics of England and most non-conformists would recognise the truth of the Anglo-catholic position, see the error of their own ways, and seek a home in the 'true' English Mother Church. The veneer that Comper put on Lound church is breathtaking and unforgettable.This church is a shrine, an uncompromising Anglo-catholic statement about belief and practice. Vatican II has moved the Roman church on from all of this, and the CofE, quietly embarassed, pushes it further and further towards the margins. But even after Comper's time, the sense of devotion here was being enhanced. As recently as 1966, it was still possible for a donor to give new porch doors in thanks for her devotion to the relic of the True Cross at pre-Reformation Bromholm Priory. And it is not every day that you hear somebody say that, especially in Suffolk.